The DA on Sunday announced Solly Msimanga as its candidate for Gauteng premier in the 2019 elections. The Tshwane mayor first has to clear his name of controversies relating to some of his appointments and then build his profile outside of his home city if he has any chance of achieving the DA’s goal of taking Gauteng. 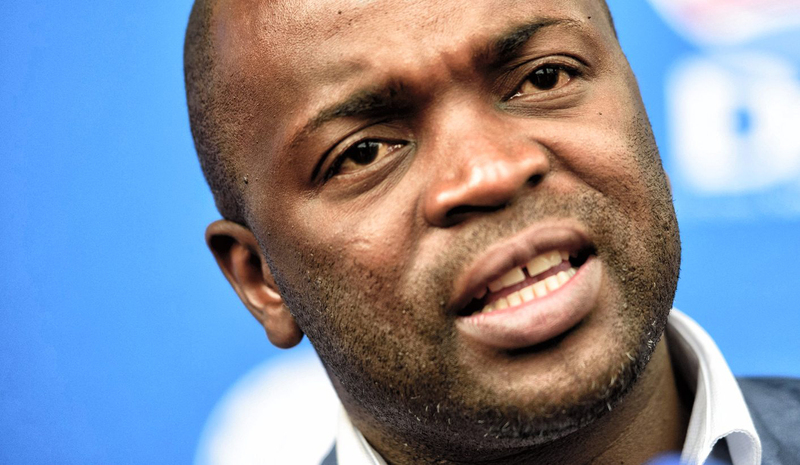 The DA’s Tshwane mayor, Solly Msimanga, stood out at the party’s April national congress. He rose to challenge the party leadership’s decision to water down the party’s proposed diversity clause, and called for further debate. While party leaders presented a constitutional amendment based on behind-the-scenes negotiations, Msimanga had been pushing for a DA constitutional amendment that would promote the party to appoint public representatives more in line with the country’s demographics. DA leader Mmusi Maimane on Sunday announced that the Tshwane mayor was the party’s candidate for Gauteng premier in the 2019 elections. Msimanga might have been the party’s best choice, enjoying a higher profile in the province than his opponents in the race, but he comes with baggage. Msimanga, a member of the DA for 14 years, was elected Tshwane mayor after the DA, despite losing the minority vote to the ANC, managed to form a coalition with minor parties and win support from the EFF. He is charismatic, but at times his directness comes across as abrasive. “Gauteng will be a central battleground in the election campaign next year and we are confident that Solly will lead a team that will bring the change the people of Gauteng deserve. Solly possesses the experience, temperament, integrity and expertise to lead the DA to victory in Gauteng,” said Maimane on Sunday. “Solly represents a new generation of leaders in the DA – young, charismatic, articulate, competent, and wholeheartedly committed to improving the lives of South Africans, particularly people oppressed by unemployment and poverty,” said the DA leader, speaking at the party’s Johannesburg headquarters. The DA wants to control Gauteng and Northern Cape after the 2019 elections, whether with outright majorities or through coalitions. The DA would almost need to double its voters in Gauteng to win a majority in the province, which is unlikely. Msimanga might have been the best choice to lead a coalition government. The country’s second largest opposition party, the EFF, has expressed more support for Msimanga over the DA’s Nelson Mandela Bay Mayor Athol Trollip or Johannesburg Mayor Herman Mashaba. If the DA is to govern the province come 2019, it will probably need EFF leader Julius Malema’s support. Msimanga beat DA MPL and former youth leader Makashule Gana and the party’s rather recent recruit and 2016 candidate for Ekurhuleni mayor Ghaleb Cachalia to become the party’s provincial candidate. Gana campaigned early, but did not have the profile or win enough internal support. Cachalia, a staunch conservative, was unlikely to win voters or be able to woo opposition parties into a coalition. Msimanga will probably run against ANC provincial chair and current premier David Makhura. Makhura has improved on his predecessor Nomvula Mokonyane’s reputation, at least making tangible attempts to show he cares about the public, but he has been held back by his government’s failures on issues such as housing, economy and health, and his links to those accused of corruption such as ANC provincial chief whip Brian Hlongwa. Msimanga comes with his own controversies. He has had to defend appointing a politically connected body-builder in the mayor’s private office. He also appointed a chief of staff in Tshwane without the required qualifications, who resigned after the matter was exposed. Dainel Silke, a political analyst and director of political futures consultancy and faculty consultant for Duke Corporate Education, said on Sunday that Msimanga was a reasonable choice as the DA’s Gauteng candidate considering he was more of a household name than his opponents in the race. Silke said the DA’s chances in Gauteng, however, will probably rely on the party’s policy proposals, which of late have been defined by confusion on key issues. The DA’s recent confusion over black economic empowerment policies didn’t help the party, especially as the ANC is trying to capitalise on the appointment of President Cyril Ramaphosa and his image and sentiments being a large step up compared to former president Jacob Zuma. Professor Susan Booysen, a director of research at the Mapungubwe Institute for Strategic Reflection and professor at the Wits School of Governance, said despite the controversies Msimanga has been involved in, he was probably the DA’s best choice as Gauteng premier candidate while the party suffers from internal tensions. “Any appointment that they make is a gamble, but that’s perhaps all political parties,” said Booysen, noting how all candidates are linked to scandal, and the DA’s intra-party debates. “Any appointment is going to come with internal costs,” she said.